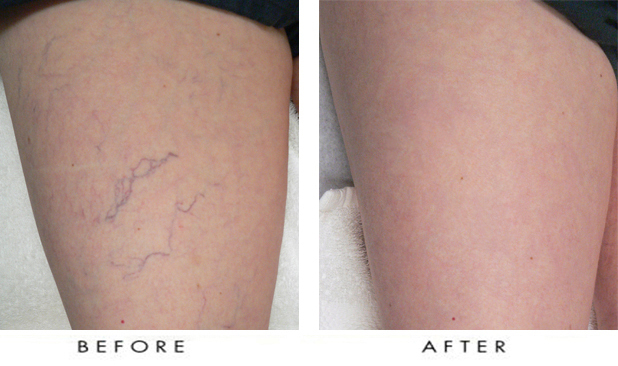 Thread veins, also known as telangiectasia or “spider veins”, are fine red or purple blood vessels which run close to the surface of the skin. They are a common complaint and are found in men and women of all ages. There is no obvious cause for thread veins in the legs. Possible contributory factors include genetic disposition, ageing, loss of elasticity in skin and blood vessels, hormonal changes associated with pregnancy and the menopause, excessive sun/wind exposure or exposure to extreme temperatures, cortico-steroid medicines and radiotherapy. Although standing for long periods of time does not cause thread veins it can aggravate the condition. How can leg thread veins be treated? Microsclerotherapy: The most effective treatment for leg spider veins is Microsclerotherapy. Before performing the treatment, our doctor will assess the venous system of the leg using ultrasound to exclude the connection between the superficial and the deep venous systems. Microsclerotherapy is performed by administering Fibrovein using a fine needle into the thread veins and the’’ feeder veins’’ called reticular veins. The injection damages the thread veins. Typically, three treatments are required three months apart. It can take between 12-18 months to experience the optimal result. Laser therapy: Vascular laser is an alternative treatment option for thread veins in the legs for clients who do not wish to have Microsclerotherapy. The laser light passes through the skin and is absorbed by the blood vessels without having any effect on the surrounding skin. It heats the blood within the targeted vessels to the point where it coagulates thereby causing the vessels to break down. Within several weeks following treatment the damaged veins are gradually dissolved and are removed by the body’s immune system, leaving little or no trace of the original lesions. More than one treatment session may be required. After treatment, redness and puffiness may occur in the treated area, this may take a few hours to a few days to settle. We review our clients in four to six weeks when repeat treatment may be administered.